I was at the public library when I came across this book "TEA The drink that changed the world". Written by Laura C. Martin and published by Tuttle Publishing in 2007. This book traces the history of tea, tea in China, Korea and Japan, the Japanese tea ceremony and how tea was spread to the rest of the world. "During the middle of the eleventh century, the process of creating tea underwent a dramatic change in China as tea masters discovered new ways of processing tea leaves to bring forth enhanced flavor. Instead of being pounded and formed into bricks, tea leaves were dried and powdered, then boiling water was added, and the brew was whipped with a bamboo whisk until foamy. The resulting beverage was called 'whipped tea' and the taste was decidedly superior. It was sometimes poetically called 'frothy jade' because of its green color and foamy appearance caused by the whipping motion. Because the flavor was so much better, this new method of preparation proved to be a monumental step in the development of tea. This type of green tea (which we call matcha today) is still used in the Japanese tea ceremony. This new whipped tea formed what tea scholars call the 'second phase' of tea. During the first phase, brick tea was the most common form of processed tea, and during the third phase, which we're still in today, tea lovers began to steep loose tea leaves in hot water. The three 'schools' or 'phases' of tea are Brick, Whipped and Steeped, based on the most commonly used preparation method. I liked the author's use of collecting quotations on tea. William Gladstone, the British prime minister (1809-1898) was quoted "If you are cold, tea will warm you. If you are heated, it will cool you. If you are depressed, it will cheer you. If you are excited, it will calm you." Tea produced in Wuyi is also known as yan cha (rock tea). I had read that the name yan cha was used to label tea that was grown in rocky terrain in Wuyi. Da Hong Pao and Tie Luo Han, renowned oolong teas come from this location as well. A tea dealer told me that even the areas on the outskirts of Wuyi are now labelling their tea 'yan cha' to take advantage of the popularity of this tea. 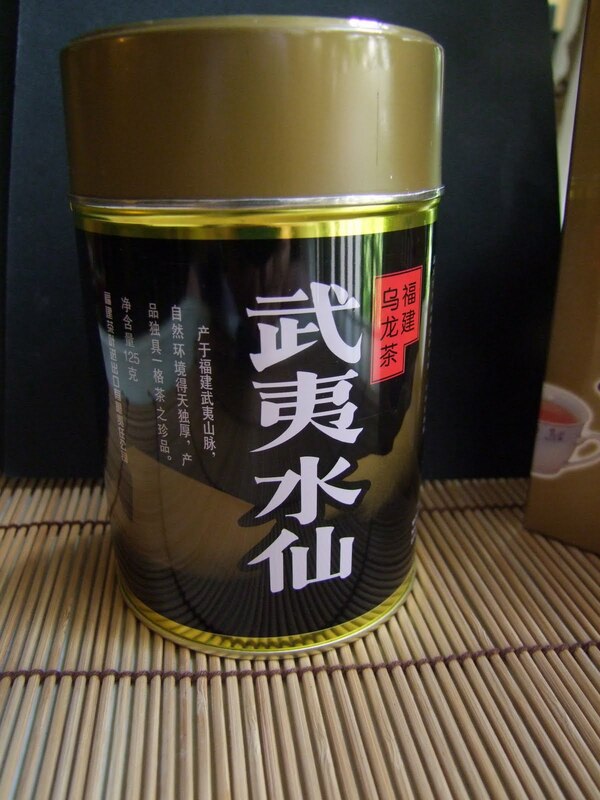 The flavor characteristics of this tea is similar to Sea Dyke's Shuixian. 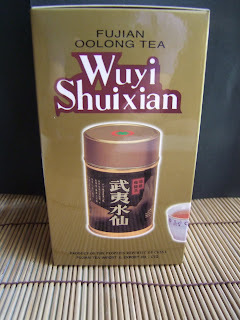 I noticed that the Wuyi Shuixian is slightly less intense than that of Sea Dyke's oolong. It is still very strong in flavor and very smooth. It literally slips down the throat and is very pleasant. Though it is slightly less popular (also slightly cheaper as well) than Sea Dyke's oolong, this Wuyi oolong has a loyal group of followers. I enjoy this tea very much. 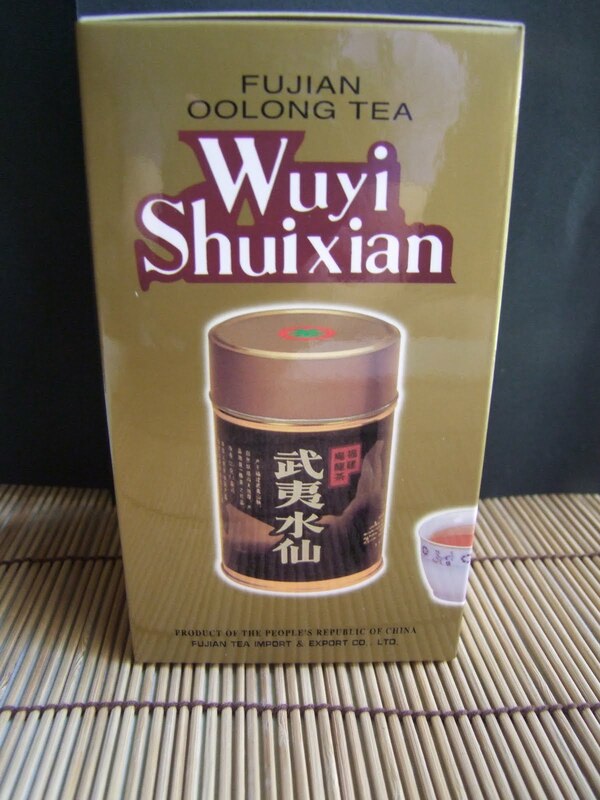 I love the robust taste of Sea Dyke's shuixian but I appreciate the slightly delicate but very smooth Wuyi shuixian. There are very expensive and better grades of oolongs than these two oolongs as mentioned above, but I believe they served as a yardstick to compare or even to start your Fujian oolong adventure. These two oolongs are very inexpensive and in my opinion, good representatives of Fujian oolongs. Forgot to mentioned that this Wuyi oolong comes in a nifty metal tea caddy that you can reuse for your tea storage. I came across this book at a used book store (such shops are a rarity in Singapore) and I purchased this book to add to my collection. "The Chinese Art Of Tea" is written by John Blofeld and published Shambhala Publications Inc in 1985. This book deals with the various Chinese teas, history of tea, tea gardens and houses, poems and songs of tea, and tea and health. The book even devotes a chapter on a "manual for practicing the Artless Tea" which the author describes "The art of tea is artless in that it is practised with the maximum of informality and freedom from restriction. There are no rules to be observed other than those pertaining to making fine tea in such a manner that its flavour and aroma are at their best........Getting the fullest satisfaction from the tea requires special state of mind analogous to what the Buddhists mean by awareness. This is achieved by attending to the responses of all the six senses: hearing, smelling, tasting, seeing, touching and consciousness. Once it has become habitual, there is no need to bestow further thought on it." The 2nd pix shows a tea brewing setup called "tea boat style" where the teapot is placed in a bowl. I am using this method to brew my pu erh teas. This dispenses the use of a tea tray to brew tea. I will pour out the 1st two infusions into this bowl before throwing out the tea. Moreover the tea bowl will collect any spillage when I pour too much hot water into the teapot. This book is out of print and a new copy fetches about US$90(I checked today) on Amazon. I personally found the writing style a little tedious to read. Click pix 3 for enlarged views. Anyway, I did not have any regrets having this book in my collection. I had noticed that Yunnan Sourcing (YS) had some interesting loose teas for sale and my recent order had included some of these teas. The pix above shows wild pu erh sun dried buds. YS described the tea as "These little white buds come from the same plant varietal of camellia tea tree that the 2005 Xiaguan Wild Ancient tea cake comes from. It is a varietal of camellia that grows in Lincang, Baoshan and Dehong area of western Yunnan. The buds are picked in late-march and then sun-dried. The flavor is fresh and a little fruity somewhat similiar to a good white tea but more complex flavors. The brewed liquor is whitish and clear, and there is a hint of fresh pine needles in the aroma"
When I received this order of tea, I had imagined that I will get to brew a pot of wild pu erh in its wildest and raw-est form. It was a surprise when I opened the aluminium foiled bag. I had forgotten about the pix posted by YS. This tea was all buds about 1 cm long with whitish hairs on the buds. YS had classified this tea under the 'white tea' category and I decided to brew this tea as a regular white tea......which for me is to take a pinch of tea, put it in a regular size mug and pour hot water. Surprise....YS was right.....it has taste characteristics of a white tea. I did not detect any raw pu erh tea taste in the brew. 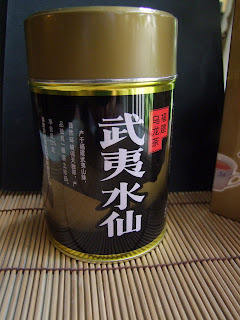 Instead, this tea has hints of white silver needles and pai mu tan (white peony) tea with a slight sweet aftertaste. I would recommend this tea to those that favor white teas. A 100g pack which I ordered is a good quantity to start with. Nice.